Reggae and dub legend Lee Scratch Perry is the subject of a new documentary. That said, Lee Scratch Perry’s Vision Of Paradise is anything but a standard biopic. More fairytale than biography, Vision Of Paradise is the culmination of German film-maker Volker Schaner’s journey to the heart of Perry’s universe. Fifteen years in the making, Schaner joined Perry on trips to Jamaica, Ethiopia, Germany, Switzerland and London, gaining his trust and confidence to come away with an unprecedented insight into the art, life and mind of one of modern music’s great visionary innovators. As much dream sequence as narrative journey, the film is animated in a Yellow Submarine-meets-Ethiopian orthodox style, tracing Perry’s life and legacy from working under Coxsone Dodd in ’50s Jamaica, to the founding of The Upsetters and Black Ark recording studio, where he worked with Bob Marley, Junior Murvin, the Congos and countless others. An influence on artists across the world of contemporary music beyond the Black Ark (which burned down, apparently torched by Perry himself, in 1978), he’s gone on to record with The Orb, Keith Richards, The Beastie Boys, George Clinton and David Lynch to name a few. 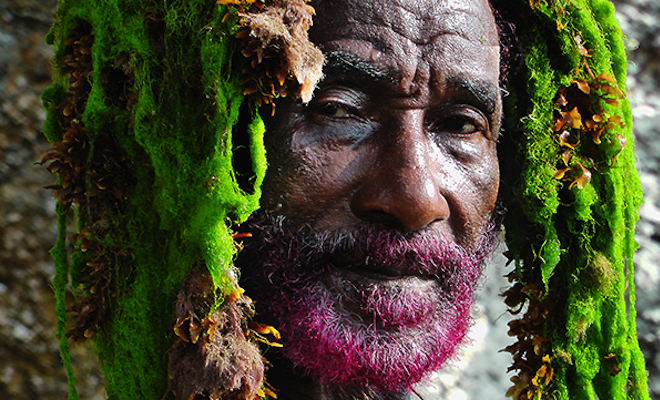 Lee Scratch Perry’s Vision Of Paradise premieres at the 14th East End Film Festival on 4th July. Click here for more info. This UK premiere gala screening is open to the public and includes a Q&A with Lee and director Volker Schaner. Book your tickets here.